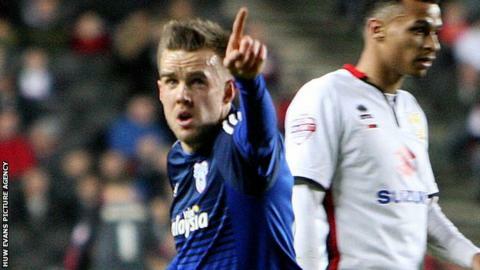 Craig Noone believes Cardiff City are good enough to challenge for promotion to the Premier League. Cardiff are 10th in the Championship, four points outside the top six after losing 2-1 to MK Dons on Boxing Day. Noone came off the bench to score in that match, and believes Cardiff - who are away to 15th-placed Nottingham Forest on Tuesday - can still be "in and around" the play-offs. "I think we can challenge, most definitely," he said. Noone is convinced the Bluebirds can bounce back from the set-back at Stadium MK. "That's the key in the Championship, there's always a game around the corner to put things right and hopefully we'll do that against Forest." Cardiff beat Forest 2-1 at the City Stadium in September, but Noone expects a tough challenge with every team having played each other at least once this term. "It'll be a tough game I think," he said. "We're over the halfway mark of the season now and we know what each and every team is about but we go into the game hoping to get three points. We're at home and hopefully we'll do that. "I think we should definitely be in an around the play-offs and perhaps we're a little behind where we should be maybe, but we've got the remainder of the season to put that right." The 28-year-old former Brighton and Plymouth winger Noone will be hoping to start against Forest after impressing as a substitute. His 80th-minute goal brought Cardiff level against the Dons, before Josh Murphy's stoppage-time winner consigned Russell Slade's team to a second successive defeat.